The choice of an engagement ring may be pretty hard. Naturally, you would want the woman in your life to be so impressed, that she would immediately scream ‘Yes!’. And if you messed up at some point of your relationship, you probably hope that an expensive engagement ring with more than three diamonds will make up for it. If we just read your mind successfully, here are some suggestions for you. This beautiful engagement ring setting is designed by Scott Kay. 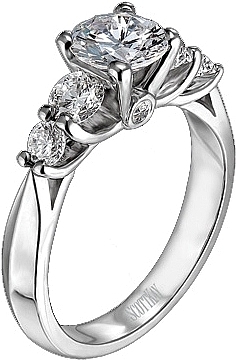 It features two graduated prong set side diamonds on either side of your choice of a center diamond. The engagement ring can be ordered in 14K or 19K white or yellow gold, palladium or platinum. The setting can be accommodated to different sizes and shapes of diamonds. If you think that this engagement ring will impress your girlfriend, go for it. If not, keep looking. Our next suggestion is this beautiful engagement ring. The central stone is a princess-cut 2.03 Carat diamond with color ranking of I and clarity ranking of SI2, set in platinum. 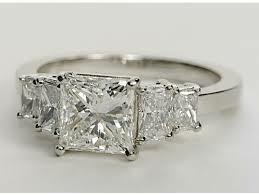 There also are four square brilliant-cut diamonds, two on each side of the central stone. Engraving is available in the basket for an additional cost. Maybe this stylish engagement ring will get you the positive answer you’re looking for. In not, we have one more suggestion for you. This elegant engagement ring with five diamonds is truly impressive. 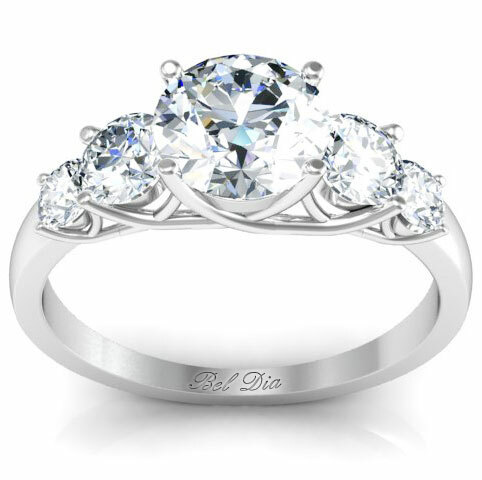 The round diamonds have U-shaped trellis-style setting. The center round diamond features four accent round diamonds that taper in size. When you look at the ring from the side profile, the ring just has a gorgeous flow to the setting. When you’re looking for an engagement ring, keep in mind that the number of diamonds will not determine if your girlfriend will accept your proposal. If you really love each other and are prepared to take the next step in your relationship, you can propose with any ring. And don’t forget to figure out a creative way to pop the question.